Neurochrome run by Tom Christiansen is based in Calgary, Canada. I founded Neurochrome in 2010 to provide well-designed high-end audio circuits to the DIY audio community and it quickly grew to a self-sustaining hobby. 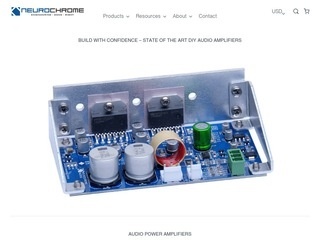 This early success provided me with valuable insight into the DIY audio market and also made me realize that to grow Neurochrome into a business I would need to adopt a business mindset. This change in strategy and the growth which followed allowed me to leave my job with Texas Instruments (formerly: National Semiconductor) in 2015. I had worked at TI/NSC for a decade and wanted to pursue other passions; one of these passions being high-performance audio circuit design. I am now relying on Neurochrome as my only source of income while I pursue a second career, following another passion, in psychology. I am presently a full-time student at the University of Calgary and expect to graduate in 2018. Following my graduation I plan to spend a year pushing on Neurochrome full time, though I may decide to go for an MBA to hone my business skills.